KANSAS CITY, Mo. 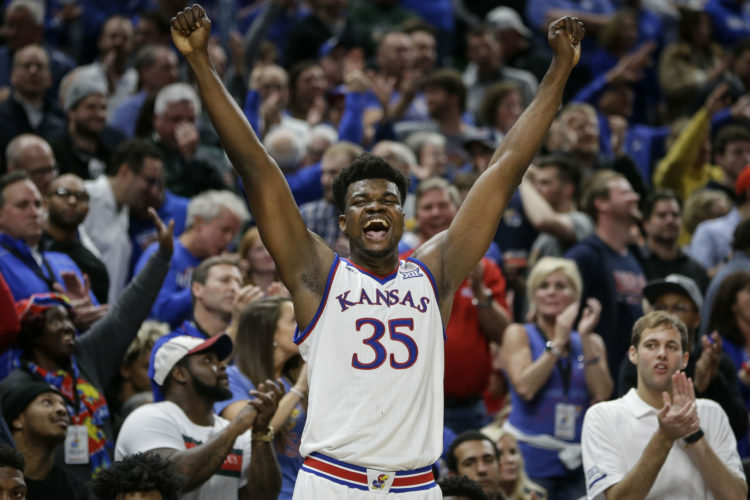 — Even without its all-Big 12 center, the top-seeded Kansas basketball team wasn’t about to fall to the same opponent for a third time this year. 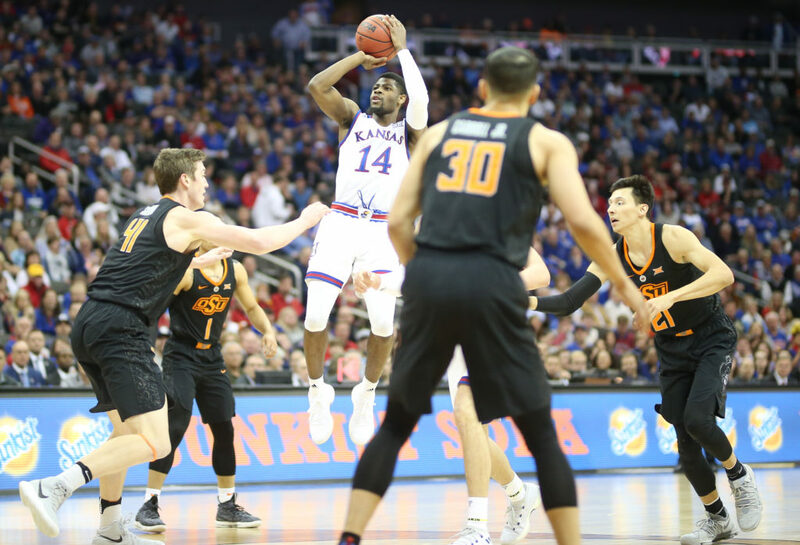 Malik Newman scored a career-high 30 points and the trio of Devonte’ Graham, Lagerald Vick and Svi Mykhailiuk added 34 more as the Jayhawks overcame a double-digit first-half deficit and avenged a pair of earlier losses against Oklahoma State, winning 82-68 to advance in the Big 12 tournament. 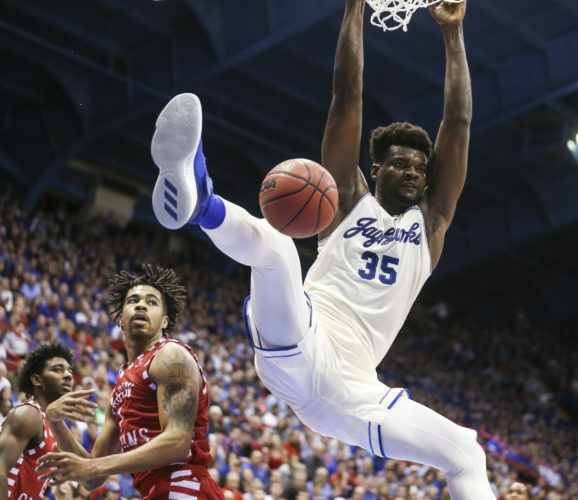 In the absence of Udoka Azubuike, the Jayhawks relied on Mitch Lightfoot and Silvio De Sousa (six points, eight rebounds) to play a heavier role. Lightfoot got the start and posted eight points and six rebounds — in addition to taking two charges — while De Sousa came off the bench less than five minutes into the contest and flashed his athleticism, throwing down a pair of athletic dunks in the first half. The Jayhawks executed better on the defensive end than in either prior meeting against the Cowboys, at one point holding Oklahoma State scoreless for a near-eight-minute stretch while embarking on a 14-0 run. • The game turned when: KU survived its first-half foul issues. Without much of a bench to fall back on, the Jayhawks could’ve easily found themselves in a hole in the first half. 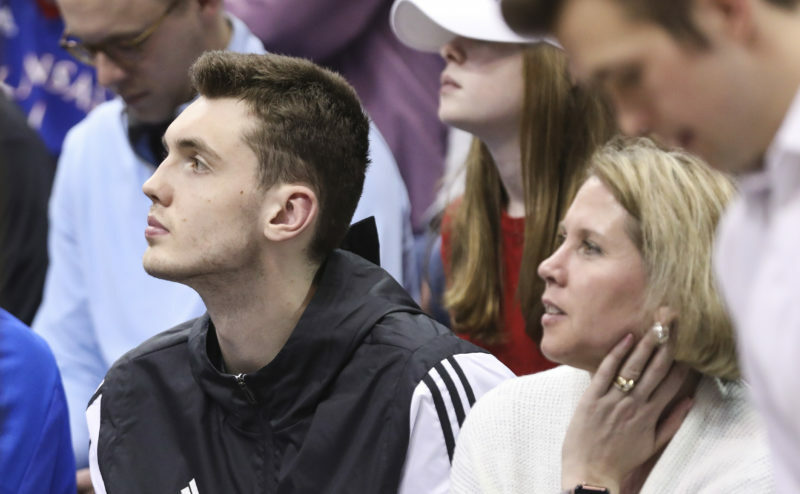 As it were, they had already trailed by double-figures before both De Sousa and Lightfoot picked up their second fouls, leading to coach Bill Self putting in James Sosinski before the end of the period. But thanks to a variety of performances, the Jayhawks not only held serve at the half, but actually led by a point. Newman scored 20 points in the first period, hitting 8 of 10 shots from the field and going 3 for 4 from 3-point range. De Sousa added four points and seven rebounds, while Mykhailiuk competed for a tough offensive rebound and put back to end the half on a high note for a KU team that had much, much more in store. Lagerald Vick started the second half with an athletic baseline drive and dunk and added a tip-in off a Lightfoot miss moments later to put KU up six. The Jayhawks continued to push out their lead and even went ahead by double-figures, 61-50, as Devonte’ Graham swatted a shot on one end and pulled up for a 2-point jumper the other way. Newman connected on his fourth 3-pointer down the stretch for the Jayhawks, who set a new program-record for most 3-pointers made in a season. 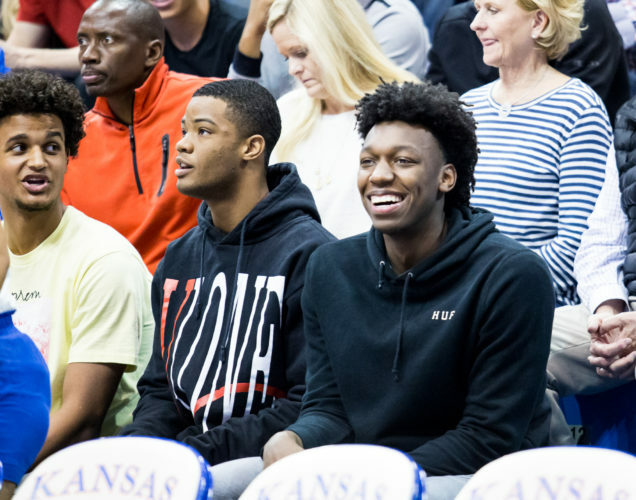 The Jayhawks finished the season winning one of three games against the Cowboys, who were on the bubble for making the NCAA tournament entering the day. • Offensive highlight: It wasn’t the flashiest of highlights, but it was perhaps the most promising for the fans wearing blue in Sprint Center. 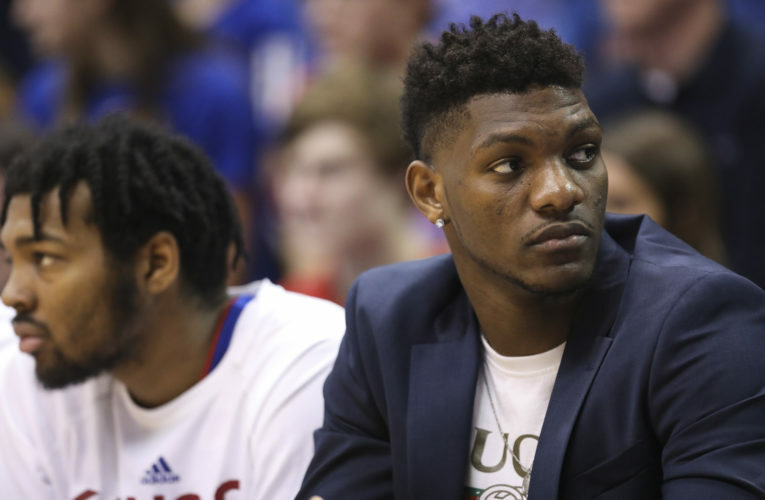 With the Jayhawks trying to come back from a double-digit deficit, De Sousa rolled hard toward the rim and put his hand up, calling for a lob over the top. Graham, who had the ball, didn’t see De Sousa, but it didn’t stop the freshman from making a play. Graham passed the ball to Svi Mykhailiuk on the left wing. The senior took a dribble toward the rim and De Sousa instantly shifted his body to seal off his defender and clear a path at the rim. Mykhailiuk made the layup and was fouled. He completed the three-point play to cut the KU deficit to seven. 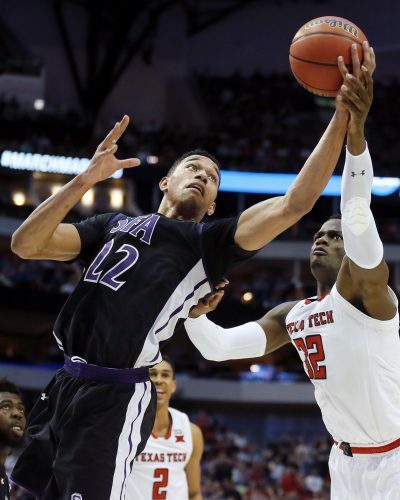 • Defensive highlight: While De Sousa missed his opportunity for a highlight slam, the first dunk of the Big 12 tournament for KU was not far behind. And it all started on the defensive end. Midway through the first half, Oklahoma State’s Tavarius Shine tracked after a ball around half court and flung it ahead blindly, trying to avoid a backcourt violation. Graham easily picked off the pass and ran down the court the other way, faking as if he was going to go for a layup and then lobbing the ball softly for Mykhailiuk. The 6-8 senior high-pointed the ball and slammed it down into the hoop with two-hands. The Jayhawks would retake the lead shortly after as Newman knocked down back-to-back 3-pointers as part of his big day. • Key stat: After getting outscored in points off turnovers, 13-5, in the first half, the Jayhawks flipped the script to build up a lead in the second. The Jayhawks, who committed only six turnovers in the first half, totaled just one in the first eight minutes of the second period. That efficiency allowed them to get out for a few chances of their own, which helped spark a 9-0 run in just two-and-a-half minutes of game time. • Up next: The Jayhawks will face off against Kansas State in the semifinal round of the Big 12 tournament. The Jayhawks swept the Wildcats in a pair of meetings earlier this season and have not lost to them since Feb. 13, 2015.